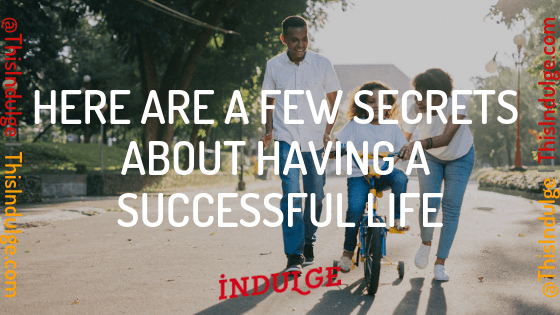 Theoretically, there isn’t any “secret” to success per se. You work hard, put your money to work for you and get to the top of the ladder. However, with that said, things aren’t exactly as simple as it may look objectively. The word success gets thrown around a lot as it is used to say someone has a vast amount of money. That's completely false. Success is how you define it. For some, it’s money; for others, it’s family. So, don’t follow others’ rules and definitions. Find your happiness! Which is whatever brings you purpose and self-actualization. The likes of integrity, commitment, honesty, honor, and dignity are fast fading from the corporate and entrepreneurial space. However, they are essential, if you want to be successful. Hold your values at the top. It's essential for you to build your values as it is for you to know what you want to be and who you are. Values are something we all have as they are just embodiment of anybody surroundings as to how they will react to a situation, but it's up to you to choose which one you want to add to your toolbox to help you develop into whom you want to become. 3. Energy and enthusiasm are vital to staying motivated! Be motivated to act and stay motivated by your actions. Motivation fades rather easily. Moreover, you know it too. To sustain that motivation or to continue on the journey despite that, you need to ooze energy and enthusiasm. It’s fundamental to enjoy what you’re doing and to keep going even when the path ahead gets jerky. As what we obsess over is what usually ends up succeeding in the end so that idea you have, it may not be perfect but get others' opinions about it to make it better. Keep yourself energetic, and you will automatically find all the distractions and negativity perish instantly. No one has ever succeeded while still cocooned in their comfort zone. Also, this isn’t just only about taking risks. Going out of your comfort level also means trying newer things, experiencing different experiences, making yourself uneasy in certain situations. If you want to live a successful and content life, the process is ongoing. There’s no “I have done it” – it is always “I am doing it.” In your pursuit to the top, there’s no specific destination. You can certainly use metrics like money to make success-claims. However, it’s a long, never-ending journey that you cover for as long as you live. That's why deploying patience and looking at success from the macro perspective becomes so very important. By that we mean do one thing at a time as every other company in any industries have done. Pick a niche and stick to it and build until your an authority in that niche but always start with the end in mind, so you know what direction you want your business to go. These are five secrets of a successful life that only those at the top know, realize and have experienced. So, if you want to succeed, define success, create and uphold personal values, make being energetic a habit, pop your comfort bubble and keep on walking on this journey to no end. If for you success is financial freedom and working for yourself. Well, I'm taking this online academy to help me improve, grow and become whom I want to be so I welcome you to join me. We've partnered with The Income Incubator Academy to get you 70% OFF-Use the code: "thisindulge-20"-a limited time offer created just for you, take advantage of it and learn something new to help you in your journey.